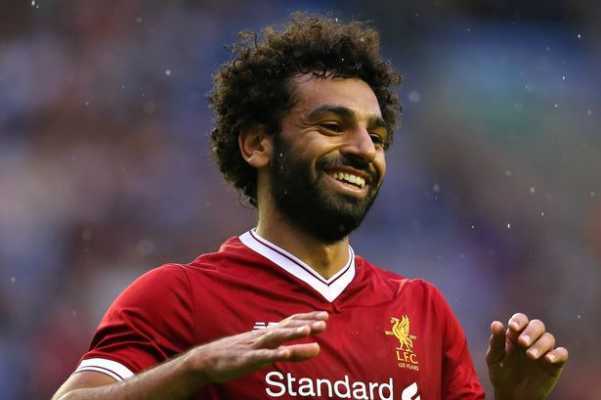 Liverpool forward Mohamed Salah scored a wonder goal for his team in the 2-0 win over long-term nemesis Chelsea thus propelling the Reds to the top of the Premier League table. The Merseysiders needed to beat top-four chasers, Chelsea, to end the weekend at the Premier League summit and the goal from Salah was instrumental to the win recorded by the Reds. West London giants Chelsea were hoping to put spanner in the works of the Premier League title challenge just like they did five years ago when they derailed the Reds’ title bid with a 2-0 away win at Anfield during the 2013/14 season. The game is famous for the unfortunate slip from then Liverpool skipper Steven Gerrard which led to the opening goal from Demba Ba just before the halftime interval. Willian added a second goal for Chelsea in added time. Fast forward to five years, Chelsea were able to frustrate Liverpool for the majority of the first half which ended in a goalless draw. Liverpool upped the tempo in the second half and they were rightly rewarded with two goals in two minutes. Senegalese international Sadio Mane opened the scoring with six second-half minutes gone before Salah scored a thunderbolt of a goal to double the Reds’ lead. His strike is a contender for goals this season. The goals of Salah have been crucial to the Reds who held on for the points to take them to the top of the Premier League table. Arsenal still keen on Tottenham star? North London outfit Arsenal are still being linked with a move for Tottenham central defender Toby Alderweireld ahead of the coming summer transfer window. Toby Alderweireld has been rumoured to be leaving the North London outfit since the last summer transfer window with former Man United manager Jose Mourinho but the deal did not work through. However, it is claimed that Toby Alderweireld is keen to leave Tottenham for other challenges elsewhere with a number of teams hoping to land him in this summer window. Toby Alderweireld has been tipped to cost £25 million which the Gunners should be able to meet because of his level of experience and exposure. Meanwhile, it is unclear if Toby Alderweireld is the deal the Arsenal team will want to bring in due to his old age as Unai Emery seems to be ready to work with younger players and the Tottenham defender is over 30. The Gunners are, however, keen on new defenders, having conceded more goals than any of the top-six teams. Manager Unai Emery is keen to compete for the English Premier League title in the coming season and that will only be made possible if he adds more strength to his team when the summer window is reopened. Man United star Antonio Valencia seems to have confirmed his exit away from the Old Trafford after a post on his Instagram page. It has been earlier reported that manager Ole Gunnar Solskjaer has concluded that Antonio Valencia will not be a part of his team in the coming season as he hopes to secure fresh legs for the right back position. The Man United team is due for a massive overhaul as hinted by the former Red Devils boss who already revealed he would be engaging in the coming summer transfer window to add more strength to his team. After landing the job on a permanent basis, the Red Devils boss was handed the mandate to return the club to winning ways as well as compete for titles and that will only be possible with a big squad. 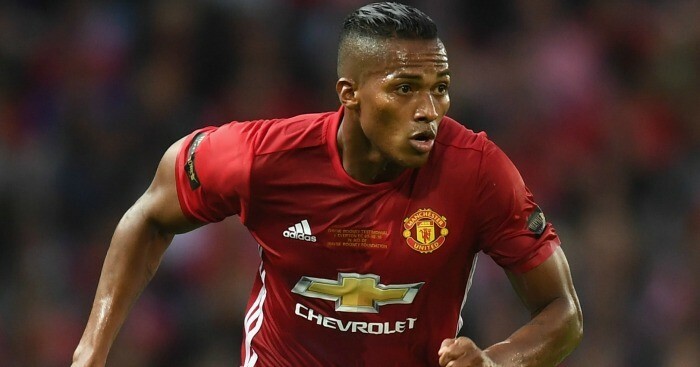 However, Antonio Valencia will not be a part of the plans as he would be heading out of the club with claims that he would be joining the MLS. Antonio Valencia was also linked with a move to the North London outfit Arsenal but there are suggestions that he will not be in the English Premier League in the coming season. Meanwhile, the former winger was transformed to right-back in 2015 under Louis van Gaal and it proved successful until he succumbed to injuries. He has made 338 appearances for the club, scoring 25 times in all. English Premier League outfit Crystal Palace star player Wilfried Zaha has blamed former United manager David Moyes for his failure to be established at the Old Trafford when he had the opportunity. Wilfried Zaha was signed to United shortly before legendary manager Alex Ferguson retired and was replaced by David Moyes but he was never given the opportunity to prove himself as he was favoured behind Adnan Januzaj, citing that the decision was not based on performance but was for personal reasons. However, David Moyes was sacked by the Red Devils at the end of the season after failing to make an impact but Wilfried Zaha was already loaned away from the club to Crystal Palace before the deal was eventually made permanent. Wilfried Zaha immediately transformed into a special player who is interesting a number of clubs including his former owners. However, it is claimed that the Red Devils are ready to bring him back to the star player to the club as they seek to land strengthen their attack. 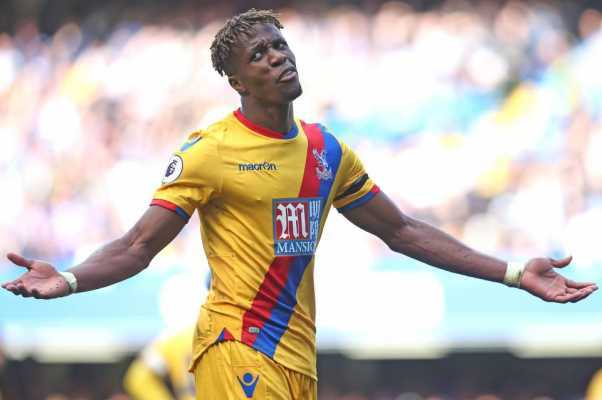 Meanwhile, Wilfried Zaha has hinted that he would love to quit Crystal Palace because he is now ready to play in the Champions League, hinting of his availability to Champions League-bound clubs. Premier League champions Manchester City have replaced title challengers Liverpool at the top of the table after their slim victory over Champions League chasers Tottenham Hotspur. It was some form of revenge for the Citizens after they were dumped out of the Champions League by the same opponent on Wednesday night. Their Champions League exit at the hands of Spurs at the quarterfinal stage ensured that the dream of winning the quadruple (four trophies) would no longer be possible for Manchester City this season. Manchester City had beaten Spurs 4-3 at home in the second leg of their Champions League quarterfinal tie but it was not enough for the Citizens who bowed out of the competition because of the away goal rule. Tottenham Hotspur had beaten Manchester City 1-0 in the first leg and that was the same scoreline recorded in their Premier League meeting earlier on Saturday afternoon. Young England midfielder Phil Foden was handed his first start in the Premier League by manager Pep Guardiola and he repaid the faith with the only goal of the game after five minutes. The slim win was enough to take Manchester City above Liverpool at the Premier League summit ahead of the Reds’ away game at Welsh side Cardiff City on Sunday evening. Chelsea forward Eden Hazard has been rewarded for his superb displays in the Premier League this season after he was named on the shortlist for the PFA Players’ Player of the Year. 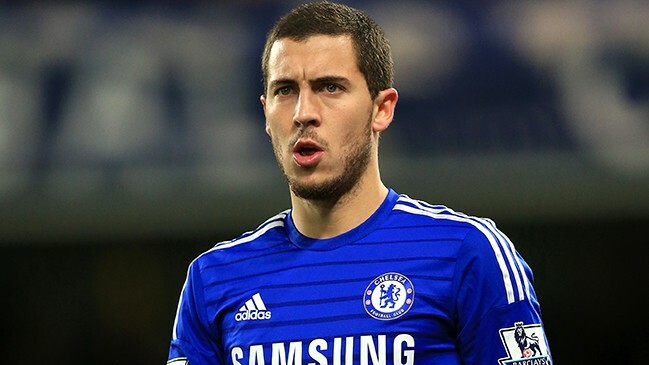 Hazard made the six-man shortlist for the Player Award which was announced by the PFA earlier on Saturday. The Belgian international player has been the key player for West London giants Chelsea in their quest for major honours in both the Europa League and the Premier League. Hazard and Chelsea are keen to finish in the top-four of the Premier League thereby qualifying for Champions League football next season. The Blues can also secure Champions League football by winning the Europa League. They are in the semifinals of the competition following their aggregate win over Czech Republic team Slavia Prague. Chelsea beat the Czech side 4-3 at home in what was the second leg of their quarterfinal clash to seal a 5-3 aggregate victory over their opponents. Eden Hazard was subbed off during that game because of a slight injury but he’s expected to be fit for Monday’s home league game against Burnley. He has scored 16 goals and also provided 12 assists in the Premier League. The 28-year-old has been involved in more goals (28) than any other player in the league. Two Liverpool players are in contention for the PFA Players’ Player of the Year Award after the list of the nominees was unveiled on Saturday. According to the list of six players released by the PFA, Sadio Mane and Virgil Van Dijk are in contention for the award. Apart from the two Liverpool players, Chelsea forward Eden Hazard also made the list after netting 16 goals and providing 12 assists for the Blues in their quest for a top-four spot on the Premier League table. Apart from Hazard, three Manchester players also made the six-man list of nominees for the PFA Players’ Player of the Year. Sergio Aguero, Raheem Sterling and Bernardo Silva all made the list for their respective performances for Manchester City this season. 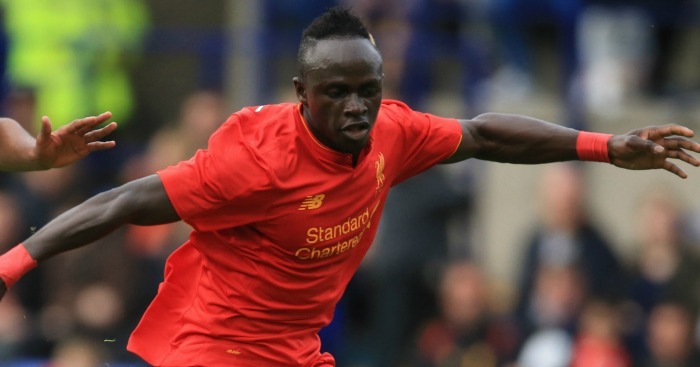 Manchester City are under serious threat from Liverpool for the Premier League title and Senegalese international Sadio Mane has played a major role. He has scored 18 goals in the Premier League and the former Southampton player is the in-form man for the Reds since the turn of the year. Dutch international Van Dijk has also been a key performer for Merseyside giants Liverpool in their quest to win the Premier League title for the first time in their illustrious history. Liverpool defender Trent Alexandre-Arnold (TAA) has made the list of players for the PFA’s Young Player of the Year. TAA was on the six-man shortlist unveiled by the PFA earlier on Saturday. The England international right-back has been in very good form for Liverpool and his form has propelled the Reds to fight for the Premier League title alongside holders Manchester City. The Reds defender has scored once for his club this season in the Premier League in addition to seven assists. TAA and Liverpool came into the latest set of Premier League games at the top of the table but they have lost the summit to rivals Manchester City after the Citizens’ slim win over London club Tottenham Hotspur. Manchester City beat Spurs 1-0 at home to move to the Premier League summit with England junior international Phil Foden getting the only goal of the game. Liverpool can go back to the top of the Premier League table with a win over Welsh Cardiff City who are in a relegation battle with the likes of Brighton and Hove Albion and Southampton. Apart from TAA, Raheem Sterling and Bernardo Silva (Manchester City), David Brooks (Bournemouth), Declan Rice (West Ham United) and Marcus Rashford (Manchester United). Aston Villa striker Tammy Abraham is a big doubt for the Midlands club ahead of their crucial league clash with Millwall in the English Championship. Tammy Abraham could be a big miss for Aston Villa having been in superb form for former European champions since he signed for them on loan at the start of the season. The Nigerian-born Three Lions of England striker joined Aston Villa from Premier League giants Chelsea on deadline day of last summer’s transfer window and he has not looked back since then. He was amongst the goals as Aston Villa boosted their Premier League playoff hopes with a 2-0 away win over relegation-threatened Bolton Wanderers. Tammy Abraham scored his 25th goal for Aston Villa in the Bolton thus becoming the first player to hit that mark for the Midlands club for the first time in over two decades. He sustained a shoulder injury against Bolton and the player had to be subbed off for Keinan Davis after 57 minutes. 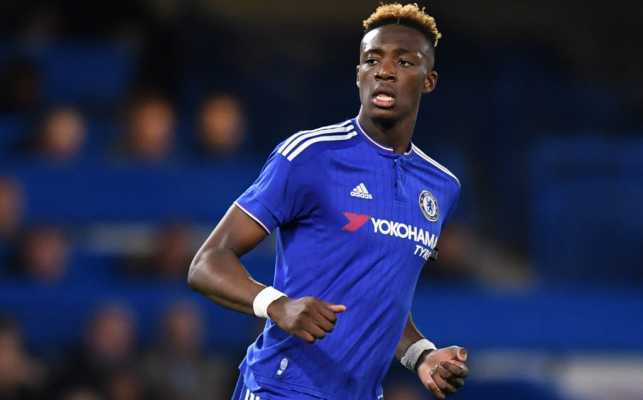 Tammy Abraham is now doubtful for the Millwall game on Easter Monday. The English striker has been a huge success at Aston Villa which his third spell away from Chelsea. Tammy Abraham spent the last campaign at Welsh side Swansea City and at English Championship club Bristol City during the 2016/17 season. West Ham United utility player Declan Rice has made the six-man shortlist for the PFA Player of the Year Award which was released on Saturday. The recently capped England international was rewarded for his superb form for the Hammers this season. His performances for West Ham United have not gone unnoticed with the big boys in the Premier League. Major Premier League sides like Manchester United and Manchester City are said to be interested in a move for him ahead of the next transfer window scheduled for this summer. Declan Rice is a utility player that can play either as a centre back or as a defensive midfielder. 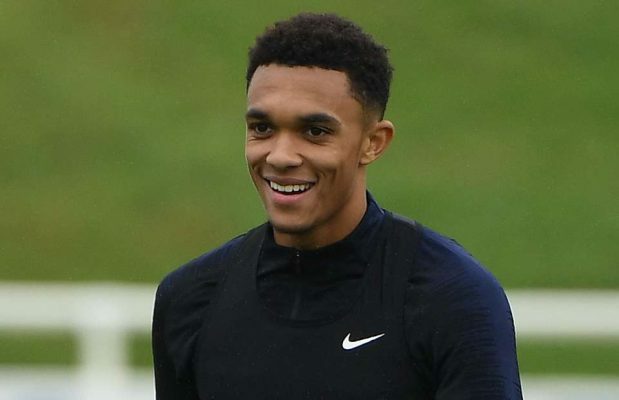 He became an England international last month when he made his debut against Montenegro in what was a Euro 2020 qualifier. Declan Rice impressed a great deal as England recorded a second successive win at the start of their qualifiers via a 5-1 victory over Montenegro. He had previously played three games for the Republic of Ireland before deciding to switch to England since he has not represented them in a competitive game. 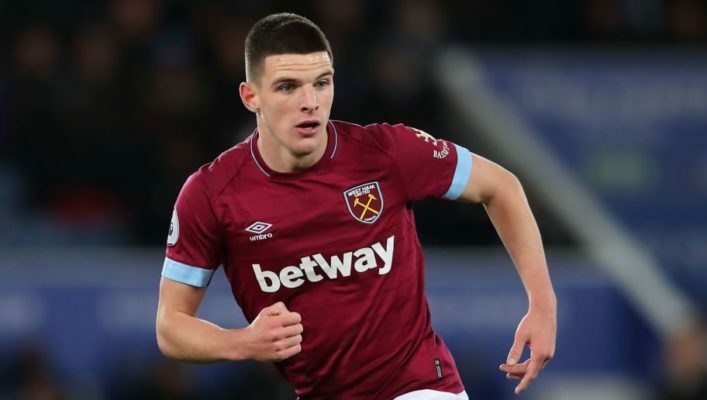 Declan Rice was a former trainee at West London giants Chelsea before he was released at the age of 14. He joined West Ham United on a free transfer after his release at Chelsea. Manchester United are running out of games in their quest to make the top-four at the end of this Premier League season thereby qualifying for the Champions League next season. The Red Devils trail Arsenal in fourth place by two points and they have five games left to claw back that advantage starting with the Everton game on Sunday afternoon. The Toffees face Manchester United at home with an agenda of their own which is a possible qualification for the Europa League via a seventh-place finish at the end of the season. Just like what’s obtainable with Manchester United, Everton are in a four-team battle to finish in the seventh spot with the likes of Watford, Wolverhampton Wanderers and Leicester City. On the part of Manchester United, the Red Devils are in a battle for the third and fourth positions alongside Tottenham Hotspur, Arsenal and Chelsea. Manchester United were dumped out of the Champions League on Tuesday night by Spanish champions Barcelona meaning that they can’t qualify for next season’s competition by winning it this season. The Red Devils will start as slight favourites ahead of the Toffees who have winning odds of 3.05 according to Surebet247. Manchester United have victory odds of 2.35 while the possibility of a stalemate is at 3.45.